Melbourne-based producer Monkey Marc writes sonically rugged, politically charged music in his solar-powered studio by day, and plays it on his solar-powered sound system by night. Monkey Marc has produced music for artists including Roots Manuva, Soom T and YT, as well as being known as the mastermind behind political hip hop punks Combat Wombat. 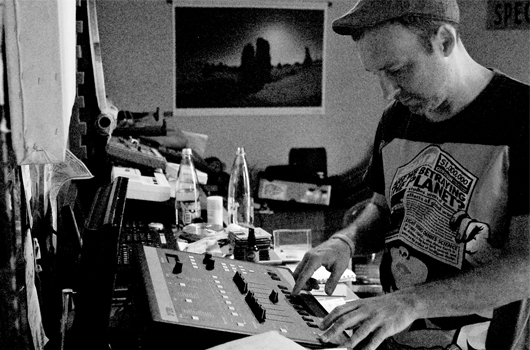 Monkey Marc began producing music with a tape machine and a one-second sampler in the late 90s, when his passion for bass lead him towards the sounds of jungle, breaks and hip hop. In 1998, he co-founded the renegade Lab Rats Solar Sound System with Izzy Brown. They travelled across the country to the front of protests and blockades, running huge environmentally sustainable parties in areas as remote as the Roxby Downs uranium mine in South Australia to many forest blockades. Monkey Marc's obsession with alternative energy and passion for social and environmental change led him to build a solar-powered recording studio in a converted shipping container in 2009. He later co-founded the solar and wind-powered DIY Hi Fi Sound System in 2013. Monkey Marc's passion for music and social change has also taken him far across the Australian outback. For over 15 years, he has run music workshops with indigenous youth and elders in more than 30 communities around Australia, using hip hop, reggae and rock music and music videos as an outlet for creativity in these remote communities. Monkey Marc has produced for and mentored bands including indigenous hip hop groups Desert Sevenz and E-Town Boyz. He has recorded in makeshift studios set up in old toilet blocks, abandoned youth centres, lounge rooms of motels and even on remote beaches with crocodiles. Releases include compilations by Barkly Desert Culture, Red Sand Culture and Western Desert Mob. Monkey currently spends up to six months of the year running workshops in remote Aboriginal communities. Monkey Marc's first solo album, As the Market Crashed (Omelette Records 2009), is an reflective journey through brooding instrumental hip-hop, dub and dubstep. Recorded entirely on solar power in Melbourne, it carries a strong message for social and environmental change, drawing upon samples that cover the global financial crises, the inequality of political systems and the world's addiction to fossil fuels. His follow-up solo EP, Monkey Marc vs The Planet Smashers (Jahtari 2013) is equal parts late 90s hip hop and new school dub, faithfully recorded to cassette and dubbed out to the max by Disrupt. It includes a dub of Roots Manuva's "Who Goes There" from 4everevolution. His most recent release, Bullets Over Babylon (Renegade Masters 2015), is a dystopian bass manifesto featuring Soom T's powerful activist hip hop and jazz underpinnings, coupled with Monkey's post-apocalytic production.